I didn’t know who Paul Walker was until he was killed tragically several weeks ago. Another man died in the wreck with him. Two mothers somewhere have lost their sons. I was struck by a news item about Walker. A young couple had met him several years ago, while shopping for a wedding ring. The guy was an Iraqi War veteran. Found a ring they really loved, but walked out without buying it. Said Walker had been just a real nice guy. They had just shot the breeze. The couple got a call later that day. The ring had been bought. We are in a season of giving. Many of us are shopping for what we believe will bring light into someone’s eyes. Make their day a little easier. Remind them of us when we are away. This story made me wonder. 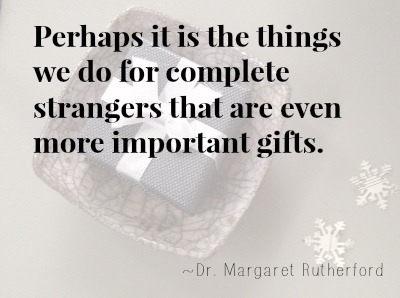 Perhaps it is the things we do for complete strangers that are even more important gifts. Letting someone cut in line if they have only three items in the grocery store line. Or they are toting a child on the verge of a meltdown. Making room for someone to pull over into your lane in heavy traffic. Just because there is no reason. Except kindness. Except a generous spirit. Maybe we can’t all buy someone a wedding ring. But to decide to do a simple act of kindness? With nothing expected in return? Perhaps we can make the effort. Thank you as always for reading! 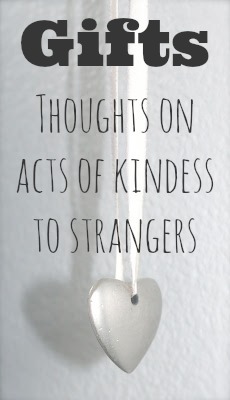 Would love to hear comments about acts of kindness done for you or yours! Or maybe you could send this to someone who has done such an act for you! Hope your holidays are warm and full of a generous spirit.